Corey Daniels has failed an English STAAR state exam more than nine times since his sophomore year. Now as a senior, he has the opportunity to graduate even if he doesn't pass, if he meets the requirements of a special committee of his teachers, principal and counselor. 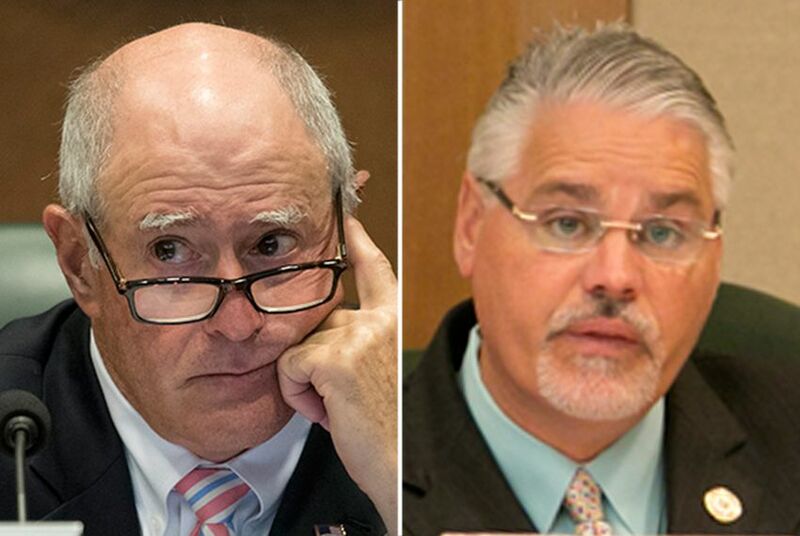 State Sen. Kel Seliger, R-Amarillo, and state Rep. Dan Huberty, R-Houston, filed bills Thursday that would allow more students like Daniels to graduate, as long as they meet the requirements of an "individual graduation committee" — even after failing required exams. Last session, Senate Bill 149 established these committees as part of a wave of legislation in the past few years to mitigate the high stakes of standardized testing. But the law included a clause that will cause it to expire by September. The new proposals, Senate Bill 463 and House Bill 966, would make the committees permanent. At a news conference Thursday, the legislators said students who graduated through the committees in the past two years have found success in the college or military. "We clearly know this worked," Huberty said. In 2015, almost 6,000 high school students graduated without passing all of their end-of-course exams, according to Texas Education Agency data. Critics say individual graduation committees weaken the impact of high school graduation requirements and decrease student preparedness for college and careers. Some members of the business community have repeatedly called for making exams and requirements stricter, not more flexible. Proponents argue state tests do not accurately represent student performance, and they say poor scores should not prevent students from attending college. "I've had colleges reach out to me," said Daniels, a student at Connally High School in Pflugerville. "It was holding me back to take this test over and over again." He is waiting to see if he passed the most recent STAAR English exam, which he took in December. If he doesn't, he will try to graduate through a committee. His sophomore English teacher, Cynthia Ruiz, would be on that committee, using criteria including his attendance record, past credits and work on class projects to determine whether Daniels can go on to college. Theresa Trevino, president of Texans Advocating for Meaningful Student Assessment, said she hopes the bills to make the committees permanent will pass easily, given data showing just a small percentage of all students have used them. "I think once the numbers are presented, I'm hoping there will be less of a roadblock," she said. In the past two years in the Arlington Independent School District, 361 students have graduated through individual graduation committees, according to district spokesperson Leslie Johnston. Arlington ISD Superintendent Marcelo Cavazos said he trusts principals and teachers to set high standards for students through the committees. He said the STAAR state exams are limited and don't provide information about students' future success. Committees allow people who know students well to "make important decisions looking at the whole context. The STAAR test does not," Cavazos said. Nearly 6,000 Texas high school students were cleared for graduation in 2015 even though they didn't pass all of their end-of-course exams, according to data the Texas Education Agency posted online this spring but did not announce. The roughly 28,000 public high school seniors who still need to pass a state exam to get their diplomas this May could get a lifeline from Texas legislators.